36 selected participants from 11 zones of the district locked horns with each other in the first-of-its-kind initiative, State Punjab Youth Parliament 2019, an initiative of the Central Government. The District Level event was held on February 6, 2019, at Chitkara University, Punjab Campus, by NSS Department in collaboration with Regional Directorate, Chandigarh. The event is a part of the National Youth Parliament Festival 2019, launched by the Government of India. Hon’ble Dr. Madhu Chitkara, Vice-Chancellor, Chitkara University; Ms. Madhu Bala, Regional Director NSS, Chandigarh; Shri. 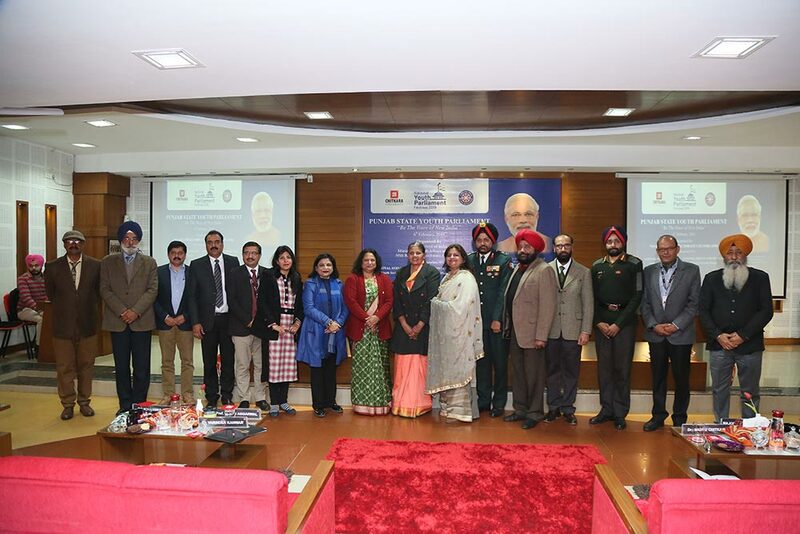 Charanjeet Singh, State NSS Officer, Punjab; Mr. Vikramjeet Singh Rana, SNO Chandigarh; Uttamjot Singh Rathore, State Director, NYKS, Punjab & Chandigarh; Major General RS Mann, Additional Director General, NCC Punjab; Col Navjot Kang, CO 5 Battalion NCC, Punjab; Mr. Paramjeet Singh, District Youth Co-ordinator, NYKS, Mohali; and Dr S.C Sharma, Registrar, Chitkara University, Punjab, graced the occasion with their presence. The participants were evaluated for articulation; clarity of thought; content knowledge and demeanor. The best three speakers at the district level will participate at the State Level. The two best speakers at State Level will participate at National Level schedule for February 23-24, 2019. The three best speakers at National Level will be awarded Rs 2 lakh; Rs 1.50 lakh and Rs one lakh, respectively, along with a Certificate of Merit. At the District Level, Ms. Shelly Mannan from Amritsar bagged the First Position, while Mr. Brinderjeet Singh from Ludhiana secured the Second Position. Ms. Gurveen Kaur from Chandigarh was placed Third. The grand event, organised by Chitkara University, was adjudged by Dr Varinder Kanwar, Vice-Chancellor, Chitkara University, HP; Dr. Mohammed Rafi, Chairman, Education Wing Punjab; Prof. Rohini Aggarwal, Head Department of Hindi, Former Dean-Faculty, MDU-Rohtak; Wg. Cdr. R.S. Gill; and Sh. Hardyal Singh Kamboj, MLA, Rajpura, Punjab. National Youth Parliament Festival 2019 is organised on the theme of “Be the Voice of New India” and “Find solutions and contribute to policy”. Youth in the age bracket of 18-25 years are invited to participate in the District Youth Parliaments. This is done in order to hear the voice of youth in this age bracket who are allowed to vote but cannot contest in elections. The National Youth Parliament Festival will also encourage the youth to engage with public issues, understand the common man’s point of view, form their opinion and express these in an articulate manner. Relevant and effective voices on the vision of New India would be captured and documented to make these available to policymakers and implementer to take it forward. Besides providing a platform to develop and enhance youth’s decision-making abilities, the event will obtain and document their opinions on Vision New India-2022. Best ideas and solutions will be provided to policymakers and implementer to resolve the country’s problems. To ensure the participation of youths in sufficient number, the screening test is being conducted at different locations. The screening assessment was organised following two methodologies – Digital (sharing videos on You-Tube) and Walk-ins (face to face interaction). The National Level challenge is slated on February 24 and 25 at New Delhi.